Member conversations about a club can happen anywhere. Compelling stories can be shared that promote the advantages of membership and benefits of belonging. Unfortunately, the opposite occurs when members detract from the positive image of the club by pontificating on a negative experience they had. Member sentiment towards a club can have compounding effects that can drive sustainability or stifle growth. When club experiences align with member expectations, membership loyalty is inevitable. The Net Promoter Score created by Fred Reicheld and Bain & Company is a proven metric for measuring loyalty. In a private club, the NPS question can be designed to gauge a member’s willingness to recommend the club to others. The NPS process goes beyond measuring satisfaction, offering management specific feedback of how to improve the club to a level where members become advocates for promoting the club. When done properly the Net Promoter Score system is one of the best preferred tools to discover ways to increase membership matriculation and reduce attrition. The NPS is based on a scale of 1 to 10, with 10 being highest centered on the following question: “What’s the likelihood that you would recommend our club to a friend, family member or colleague?” Based upon the number rating a member chooses, they’re classified into one of the following categories: “Detractors,” “Passives,” and “Promoters.” Once calculated, scores are categorized as: 0 – 6: Detractors, 7 – 8: Passives, 9-10: Promoters. It is recommended that the question responses show only the numbers to avoid influences from the categories. To determine the Detractors percentage, take the total number of responses and divide it by the total number of survey responses to the NPS question. Do the same for the Promoters. Next subtract the percentage of total Detractors from the percentage of total Promoters to get the NPS score. Passives are not used in the formula. The lowest possible score is -100 and the highest score is 100. To measure performance improvement on an annual basis, the NPS question should be included in yearly membership surveys. The qualitative feedback that the NPS generates gives you the “why” behind the voice of the member. For the question to be most effective think of it in two parts. First, it provides club leaders with a measurement of member loyalty to the club. In addition, the design of the question captures the member’s attention, building awareness around the importance of referring potential members to the club. 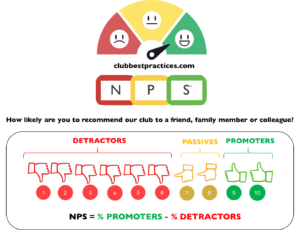 The second benefit of the NPS score is to follow up with open-ended questioning of “why” the members gave a specific score to determine member sentiment. This can be done in a focus group setting to provide deeper insights to member preferences and opinions. During the focus groups the question can be reframed to focus in on programming, services, activities, etc. One of the greatest benefits of the NPS process is how the follow up provides opportunities for management to benchmark success, enhancing the member experience and value of membership. It creates improvement measurements to increase Promoters and reduce Detractors at an operational level by investigating the source of Detractors responses. It frames discussions of Board and Management around critical thinking that leads to strategic initiatives focusing the best ROI of available resources, minimizing costly “one off” decision making. It identifies the tactical priorities that align with improved member experiences of various segments of membership. The purpose of the NPS question is to initiate corrective actions that improve member loyalty. When you consider how much a member pays in the lifetime of membership through dues, minimums, fees, etc., alignment of membership preferences and club programming are a formula for success. The reduction of membership wait-lists have shifted the way clubs operate. The continued challenge clubs are facing is the ability to identify and deliver experiences that earn member trust and build expectations around organizational performance. To address this, club leaders tend to rely purely on stats to determine changes. Unfortunately, statistics do not always tell the whole story. Long term members are “emotionally invested”, their sense of belonging and third place (see previous article “Transforming Tradition”) relationships are at the club. Members will stay for a meaningful club experience or eventually leave because of irrelevance. Member longevity comes down to value; “Is it worth it to me to pay X when I don’t really use the club”? The NPS question of asking why members rate as a Detractor may provide the answer.